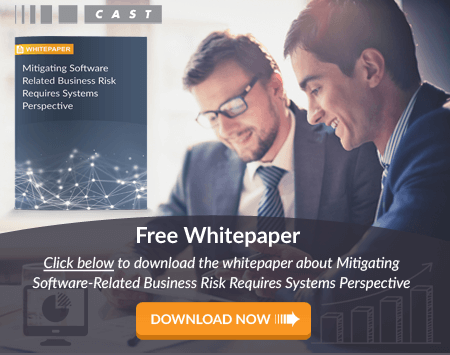 Why Is Application Risk Important to Organizations? Does your organization spend a vast amount of time fixing issues that are a direct result of poor quality or missed vulnerabilities? Are undetected flaws creating security loopholes or affecting the performance of your infrastructure? A dependable method that identifies application risk is no longer an option – it's a necessity. Automated application risk analysis is one method your organization can use to detect vulnerabilities across your entire IT portfolio. Most application risks are a direct result of insufficient structural quality and architectural integrity. An application risk assessment identifies vulnerabilities and aids in determining their potential impact to other systems, your business, and your career. Automated options allow this process to be completed faster with far greater accuracy than manual processes. Application risk analysis can be performed as applications are developed, enhanced, and maintained. This results in the real-time improvement of the overall system, reducing risk to the business while driving down rework, and repair efforts downstream. Automated solutions are capable of accurately and consistently analyzing large, complex applications by allowing organizations to detect flaws early and take actions to eliminate potential threats. Finding the right analysis software is important because many offered solutions are not capable of assessing multiple technologies or large applications against architecture standards or within multi-tier environments. CAST Application Intelligence Platform (AIP) is an enterprise application risk assessment solution that is able to evaluate numerous technologies and detect potential vulnerabilities for software. AIP delivers an objective, repeatable benchmark measurement for continuous application risk evaluation. This measurement also serves as a monitoring tool for developer productivity, quality, technical debt, vendor value, and complexity as business or user needs change. Learn more about how AIP can help your organization now!